It was a perfect sunny morning so I took the dogs for a walk by the river in Grantchester. My plan was to sit and have coffee at the Granchester Orchard tea-rooms afterwards and work on editing a manuscript. 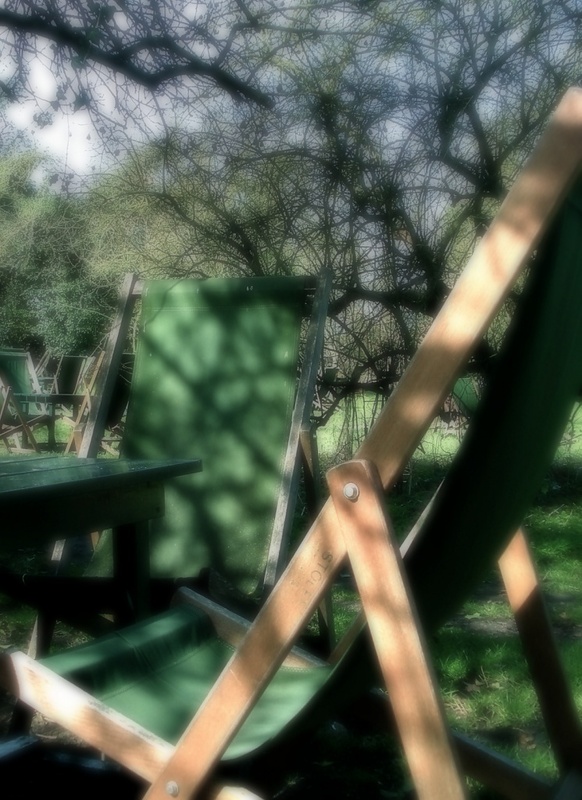 Grantchester Orchard is a deliciously romantic place, with green deck chairs scattered beneath tangled apple trees. It has a long association with literary figures such as Virginia Woolf and Rupert Brooke. I was hoping to somehow absorb their brillance into my work through a process of osmosis! However, it was not to be. I ran into two friends who were sitting in the sun over tea and scones, and joined them for a chat and my manuscript stayed in the car! Now I have to work twice as hard to make up for lost time, but it was worth it - and in fact, Lost Time is exactly what Grantchester Orchard is all about - which is what I've tried to capture in this soft-focus picture. Such a dream! The shadows of the trees and the soft focus make you feel like you have stepped into a dream and there is no sense of time. Well done! I love this! I think the shade lends itself to soft-focusing the chairs...I don't know that I could attain such a beautiful effect, but your results encourage me to try. This sounds like a wonderful place to spend an afternoon, with or without a manuscript! So lovely. Excellent descriptions. I found myself sitting wanting to sit there with you and soak up some inspiration. Beautiful! Love the how you caught that tangle of apple trees just perfectly, it's the first thing that my eye jumped to. And you didn't have to dust it. grin. So soft and dreamy. Lovely photo! Oh ... I really love the softness of this, and the tones, and the composition ... and the way it makes me feel. And I love your words just as much as the photo. You have painted such a warm and lovely picture for us, of the joy of unexpectedly meeting friends and letting other things go so that you can savor moments together. This one is just too good! I like the editing on this. Great job!